The American people have this ideology that any proposal “intended” to benefit the nation’s youth shouldn’t be scrutinized. With their individual prosperity in mind, this is why politicians have used children as “political props” in order to promote political agendas. On October 6, 2014, I published a blog about Rahm Emanuel using the safety of Chicago’s youth to justify the city installing speed cameras to fix the staggering budget deficit. Believe it or not, he’s using the city’s youth again to get residents to support his fight to save Chicago’s bid in hosting President Obama’s presidential library. With the mayoral election fast approaching and the risk of being in hot water, Emanuel is looking to secure a political accomplishment in order to improve his 44 percent approval rate. His approval percentage has fluctuated recently as Emanuel has been criticized at both economical and educational perspectives, which is why he hopes essentially kill two birds with one stone by winning Chicago the library. Standing with a group of children (pictured above), in a short speech Emanuel explained, “Presidential libraries come only once. I don’t think Chicago should miss on this unique opportunity educationally, culturally or economically.” Throughout his time in office, the Board of Education has been forced to shut down 50 schools and Chicago has become a city of big debt. By separating “educationally” and “economically” from each other, he’s trying to disguise his prime motivations behind the library that he “believes” the city’s children are entitled to. If Chicago were to host the presidential library, I believe that the city would hurt more than it would benefit. The state legislature is open to spending 100 million dollars to construct the library, even though Chicago is struggling to pay off its current debt and risks the chance of the library not being able to generate the profit that would exceed its cost. 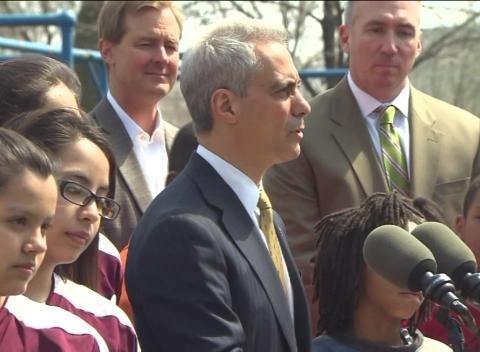 Emanuel is not oblivious to this and he’s using the city’s youth in prioritizing his own success.